Remineralizing, whitening non-toxic toothpaste powder. Replace your junky toothpaste with a healthy all-natural alternative that naturally whitens and strengthens your teeth while improving the health of your gums and mouth! 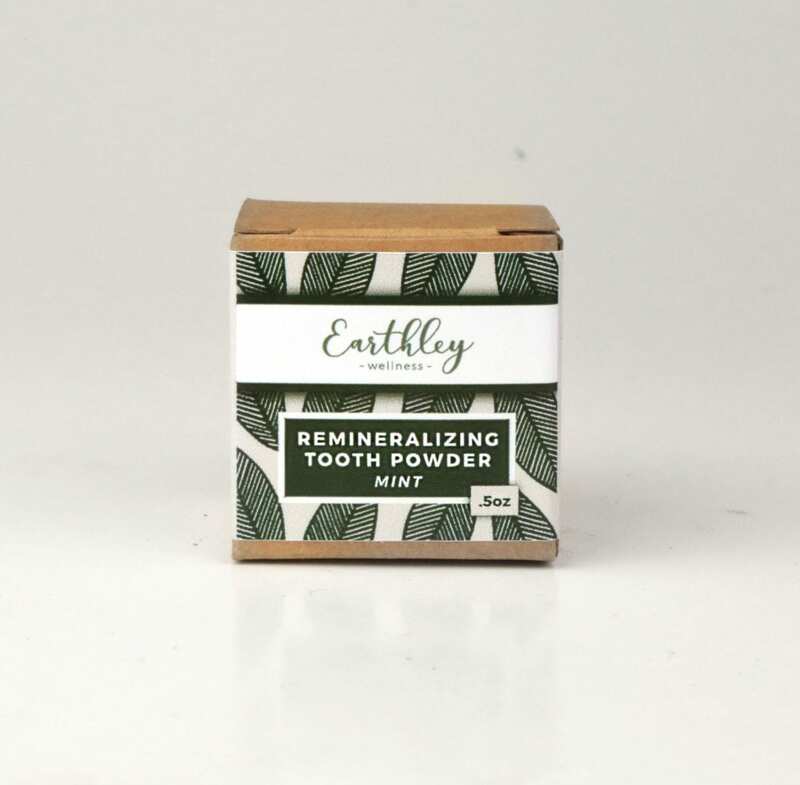 As with all of Earthley’s products our natural toothpaste powder is free of fillers, binders, magnesium stearate, sugar, colors, flavors, synthetic vitamins, and preservatives. Earthley’s non-toxic toothpaste naturally whitens teeth with activated charcoal. Our chemical-free toothpaste is formulated with bentonite clay which naturally strengthens your teeth. The truth is, there are lots of toothpastes on the market, but how healthy are they? What if a healthier option was available that was just as, if not more effective than the name-brand toothpastes we’ve been using for years? It starts with activated charcoal. Charcoal actually binds to tannins and other stuff that stains your teeth — so it actually helps to whiten your teeth when you brush with it! Then, we added bentonite clay. This clay is filled with trace minerals, which can help remineralize your teeth and as a result make them stronger. Bentonite clay can also help to detoxify your mouth naturally. We top off our natural fluoride-free toothpaste with clove and cinnamon for their anti-inflammatory properties, and lastly, stevia for flavor. Plus, stevia may benefit your mouth by helping to prevent cavities! Unlike other companies, we don’t use baking soda in our non-toxic toothpaste, which can be very abrasive and harsh on your tooth enamel. As always our natural toothpaste is free of fillers, binders, magnesium stearate, sugar, colors, flavors, synthetic vitamins, and preservatives. When you brush with the best natural whitening toothpaste, enjoy our tooth powder, knowing that it has no compromise ingredients and is healthy for your mouth! Comes in a 2-oz. jar which will last several months for one person. Spice: Activated charcoal, bentonite clay, organic clove powder, organic cinnamon powder, and organic stevia. Mint: Activated charcoal, bentonite clay, organic spearmint powder, organic peppermint powder, and organic stevia. Lemon-Berry: Activated charcoal, bentonite clay, organic lemon peel powder, organic berry powder (goji and/or schisandra), and organic stevia powder. Simply wet your toothbrush and tip one edge into the powder — you only need a small amount. Brush as usual and rinse. This is used in place of toothpaste. Do not dip very wet toothbrushes into the powder and let it get (and stay) wet. Because it contains natural, powdered herbs and not essential oils, it can mold if water is repeatedly introduced into the powder and it is closed while wet. It is possible to avoid this by pouring a tiny bit of powder into the lid, and dipping the toothbrush into that, to avoid water in the main container. Shelf Life: 1 year. Safe for all ages. Safe if swallowed. My teeth are whiter and my mouth feels healthier since adding this to my dental regime. I highly recommend this stuff and am happy I was able to find it at such a good price! I used this for about a week and went to the dentist after not going for 2 years. My dental hygienist was amazed at the lack of plaque on my teeth after having an appt in so long. Not just good for adults the flavor is not over powering which makes it great for my 6year old. I bought the mint & lemon berry. Both are excellent. I recommend both flavors. My 11 year old enjoys both flavors also. It appears messy at first because of the black color it turns your teeth but brushes off well. Thrilled to have a clean, safe and chemical free option. Will be buying again. Unfortunately this does not whiten my teeth as I think it works differently for everyone. However, it does make my teeth cleaner than regular tooth paste and I did buy more of this just yesterday. Very messy but still good for teeth. I like the mint tooth powder; my teen daughter loves it so much that she makes sure we don’t get low. She says it’s the first time she’s felt her mouth is truly clean without all the ingredients in a toothpaste making her feel queasy. It takes a little getting used to using a powder, but our mouths have never felt cleaner! We had tried another brand of tooth powder and it was pretty pricey so I was unable to continue buying it. I’m thrilled with this much more affordable brand and it works wonderfully. Our whole family uses it! IT does take some getting used to if you aren’t used to using a powder but once you get over that it works really well. My seven year old son likes(hooray!) to brush his teeth at the same time as me using the mint powder. I like how clean my teeth feel and look. I don’t know if there are enough minerals as is though to be called remineralizing. We added this toothpaste to our life a few weeks ago and I’m already feeling the benefits. My teeth are whiter and my receding gums are reversing. Recommend highly! Out of all the natural pastes and powders that I’ve used, this was my least favorite. No matter how much I brush, my mouth just doesn’t feel clean afterwards. Wow…. squeaky clean and super white!! I have been using this for a few weeks now. I got the mint flavored one. I can not taste the mint at all so to me it’s basically tasteless powder. I can’t speak to the remineralizing effects or the whiting. But I love how clean it makes my teeth and mouth feel. The only issue I have with it is having to wipe down my sink every time someone brushes their teeth as black splashes everywhere . I don’t love the grittiness of this tooth powder. The first one I received (cinnamon) had a much finer consistency that I liked better. I’d love the flavor to be a bit stronger, but overall I do really like the product as it makes my mouth and teeth feel cleaner, longer than any toothpaste I’ve ever used. I got the mint flavor in the earthly sample pack. It whitened my teeth a smidge, but nothing too exciting. It’s also super messy and gets EVERYWHERE no matter how careful you are. My sample also lacked flavor. It didn’t taste like there was any flavoring at all. I’ll use the rest of the sample but probably won’t buy anymore after. I love this product! My teeth feel so clean! Love how clean it makes my teeth feel! I have been using this for about 8 months now. It was strange at first using a black powder. But, since using it, my teeth are cleaner, they feel amazing and I have noticed that I don’t have as much tarter build up either. I also noticed it easier for they hygienist to clean my teeth because there is less build up. This has definitely helped whiten my teeth. It does get a little messy so be prepared. The price is great and the ingredients are even better. I think the flavor could be stronger, the charcoal is a bit overwhelming. I bought both the berry and the mint and honestly couldn’t tell the difference between the two BUT the actual cleansing effect is amazing! My teeth have never felt so clean from an at-home brushing. This powder has whitened my teeth quite a bit! I really wanted to love this. I never noticed whiter teeth but did notice my teeth became very sensitive. We got the mint to try and see how the family liked it.. we are all pleasantly surprised! Using powder for the first few times was a little strange but our mouths feel so much cleaner! My husband has coffee and soda stains. And after using the powder, his teeth are definitely whiter! To be honest, I was a little weirded out by brushing with a powder when I first started using it. Just too sensory for me I suppose. But my teeth feel clean. Bought this to try it out. So far so good. Can’t really tell there’s a “flavor” to it although it did smell like mint. Will get more once I’m out! This product has taken some getting used to. I wish the spice taste were stronger. It does seem to clean well and I am happy knowing the ingredients are good, however it’s messy and awkward to use. It’s very unlikely I can get the rest of my family onboard, although they are used to seeing me use weird methods such as this. We don’t do fluoride in my house, so having a clean & natural option for toothpaste is a must. This toothpaste strengthened my enamel (no more sensitivity!) and gums and eliminated a weak spot on a front tooth. I used this powder for 6 months straight and I had the BEST check-up I have ever had (ever!) at my next dentist appointment. I wasn’t sure at first. A powder toothpaste? But this stuff is great and cleaning and whitening. I got the small jar to try out and I have to say I’m pretty pleased with it so far! It has a pleasant taste (I got the mint flavor). I’m excited to use it this pregnancy to see how well it does for my teeth! I really love this powder. The mint is a bit lacking but I dip my brush in peppermint infused coconut oil then into the powder. There’s not enough flavor in the Lemon-Berry to notice, it’s a tad bit messy, and I don’t have that fresh breath feeling after I’ve brushed, but more importantly, my teeth are always very clean after using this powder, and after having cavities my entire life, since switching to tooth powder, my teeth are healthier than they have ever been before! In my mind, the pros far outweigh the cons and I will absolutely continue to use toothpowder, but I may order a different flavor next time! I was skeptical to switch from using toothpaste my whole life, to trying this tooth powder – but I’m SO glad I did it! It cleans my teeth so well, and has given me such a bright smile. My dentist was even amazed at how strong and healthy my teeth were considering I only use this or coconut oil on my teeth. Really love this powder. My teeth are whiter and my gums not as swollen. I have fresh breath. This stuff lasts forever and cleans SO well! I have to admit I was a little scared to use this. I’m glad I tried it! My teeth feel squeaky clean and look brighter as time goes on. I really wanted to love this, but I just don’t feel like my mouth gets cleaned enough. My teeth feel so clean after using this! I’m even noticing they’re not sore/bleeding when I floss, which is something I typically struggle with during pregnancy. I would love a stronger flavor and sometimes miss the feeling of brushing with “paste”, but love this powder! I had been searching for a charcoal powder toothpaste to try when I came across this one. It was reasonably priced and I loved the samp!e size I could try first. My teeth feel so clean and are noticeably whiter. I wish the mint was a little stronger, but overall awesome product! This stuff makes my teeth so white, and they feel so clean! Also, this company has AWESOME customer service. I ordered the Lemon Berry flavor, but I got a flavorless one. They corrected my order upon letting them know, and had the right one sent the same week. This company is great. I purchased the smaller one as a sample in hopes that this would help with my tooth sensitivity-it did! I noticed right away, after the first couple of times brushing my teeth with this tooth powder, that my tooth sensitivity to cold had almost completely vanished! Will definitely be buying the bigger size when this runs out. This is one product I’m just kinda “meh” about. I got the sample size spice powder and there is really no flavor to it. I miss feeling fresh breath when I’m done brushing. My teeth do literally squeak when rubbed after cleaning so I know they are clean but I don’t feel it freshens my breath in the morning and night like toothpastes I’m used to. It’s definitely messier and takes more rinsing to get all the black out and every now and then a black bit will show up later even when I’ve brushed and rinsed with water a few times to clear the powder out. I haven’t noticed any whitening a month in yet. Not sure I would purchase again because feeling like my mouth is fresh and not just clean teeth is important to me. Takes a little getting use to because it is a powder but once you get use to it you’ll love the way it cleans and knowing I’m not putting something toxic in my mouth is a plus. This is a bit different then the tooth powder I’ve used in the past. It is definitely black ! However it does make my teeth feel clean !! Wasn’t a big fan of this product. It DID leave my teeth feeling clean, but it was messy, didn’t have enough flavor, and the sample size did not even fit my tooth brush which made it a little difficult to use. My teeth look whiter and my mouth feels much cleaner. It’s also helped with my teeth sensitivity! It’s not as minty as I expected, or would like, but I love it none the less. While I do feel that this cleanses my teeth and encourages good bacterial growth, it does not freshen my breath in any kind of lasting way. It is a bit messy which I don’t mind because I know it is good for the health of my teeth and mouth. My son was a bit taken back by the texture but he did love that he could carry on Halloween with black teeth. Due to the texture I only use it on my son a few times a month and often mix it with a more traditional toothpaste and that seams to do the trick. Similar to other reviewers, I really wanted to love this product, but there are a few things that need revision in my opinion. I agree that it could use more flavoring (since the mint flavor didn’t really taste like anything) but my biggest gripe is the MESS. Oye, no matter how careful you are to mix up just a little bit, IT. GETS. EVERYWHERE. Easy to clean up, thankfully, but too much aggravation for busy mornings. HOWEVER, I do think that the product works well, which is why I gave it 2 stars instead of 1. Even though the bathroom needed to be cleaned after every application, my teeth did feel very good. The product would be improved if it were already in a “paste”. Other natural products (my current favorite, Earthpaste) have simple ingredients already in a tube. Since that may or may not be feasible for Earthley, I’d be perfectly fine with, say, having a large tub of charcoal toothpaste prepared, and using a small spatula to spread some onto my toothbrush to avoid contamination (Magic Mud, anyone?). Just SOMETHING to contain the mess would be a tremendous improvement. You guys. THIS. Stuff. Is. Amazing. I drink coffee, so I get those stains. I thought my only option was that awful bleach paste from those mainstream brands. And yah it would look better after using, but halfway through the day it looked Worse! So then I tried this teeth mineral powder stuff. OK, the black is just FUN. I mean I’m kind of a little kid with stuff like that. Like ew gross it makes my teeth black LOL! BUT I’m not even joking. It makes your teeth WHITE and they STAY white! Basically makes a new layer of defense to keep stains away. So even after a while day of coffee and stuff, my teeth still look awesome. My ONLY gripe is that the “lemon berry” is literally tasteless. It tastes like powder, it’s not good but it’s not bad. It’s just kind of lame. The spice is my favorite. I don’t use anything mint because of sensitive supply. But the spice is a really nice subtle Chai flavor. That lemon berry concept has potential though earthley! And as far as deterring bad breath, I can speak for the Spice one, it really does help. Not because you’re left with spicy mouth (it’s not spicy at all), but because it feels like it fortifies your whole mouth against bad yuckies, it’s really cool. After having exploratory oral surgery, I experienced tooth ache and gum sensitivity. Once I incorporated the mineral powder into my daily routine of after care, the ache and sensitivity disappeared almost immediately! Simply amazing! I will be recommending this product to everyone. I love this stuff! It is a bit messy with my electric toothbrush. I love the subtle taste of the spice. I’ve been using this for about a week and have mixed feelings. So my teeth FEEL CLEAN. So that’s awesome! However, my mouth in general doesn’t really? I know I’m used to tooth paste that’s suds up and makes you feel like your giving your mouth a full bath. But I just feel like I still have morning breath afterwards? Any advice on that part of it I’ll gladly take! Now, that being said, my teeth are whitening I think! It’s still a little soon to tell but I’ve been wanting something to whiten and I think this may be it! I love the toothpowder! I have thr lemon berry, and to me it hardly has a taste, but that doesn’t bother me. It *can* make a mess because it is black powder, but it’s a super easy clean up! And the powder. Works. So. Well. I can tell a difference in my teeth. Whiter. And my breath feels fresher! Update from using this for a while. This is very hard to use without making a mess. The directions say to dip your brush in but I don’t want to contaminate it. I really dislike the powder form and wish it came in a paste form. The reason being (aside from the mess issue) is because I end up inhaling it and it doesn’t fee very pleasant in my lungs. As far as cleaning goes it does a great job but I don’t think I’ll buy it again unless it in a paste form. Maybe I’ll mix it with coconut oil to use up the rest so it doesn’t go to waste. I was skeptical to switch to a powder but I was pleasantly surprised. It has just a slight flavor so my kids could handle it and their teeth look better than ever! Our dentist even commented that our teeth and gums looked good. My teeth have been slowly getting whiter as well which I can only assume is from the tooth powder. I have a VERY picky 12 yr old. I’m stilled amazed that she loves this! She doesn’t even like lemon but loves the lemon-berry flavor. I’ve noticed her teeth having less plaque & being whiter too! I have mixed feelings about this tooth powder. First the good. I love how fresh my mouth feels and how white my teeth look when I use this. However I really hate how messy this stuff is and because I don’t want mold to form in the jar, I pour it into a separate dish each time I use it, but just pouring it into a separate dish I end up losing a little of the powder. I would LOVE if Earthley made this into a paste because it really does a great job of whitening. I wouldn’t say it tastes super minty, but there is a faint flavor of mint present. It tastes “earthy”–that’s the best way I could describe it. Overall I love the concept and ingredients, but wish it could be improved by making it into a paste. Been using this for over a month now and really love it. At first it was messy, but I have gotten used to it and not so messy now.